Castlevania is not only one of the most famous vídeogames franchises ever – and the latest entry in the series, Castlevania: Lords of Shadow, is an amazing reinvention –, so it’s perfectly understandable that so many software studios and independent developers look at it for inspiration. And so, games such as Requiem of Blood are released. 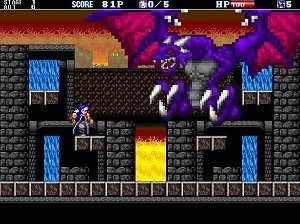 Requiem of Blood is a free action platform game and a perfect throwback to the nostalgic 8-bit era. The retro style is simple and competent and there is a diverse arsenal at our disposal. Use your whip, chains and several spells to defeat your average bat and skeleton, but also the huge end bosses, including fearsome dragons. Overall, although this won’t be remembered in history, it remains a charming Castlevania-inspired action game with fun gameplay.